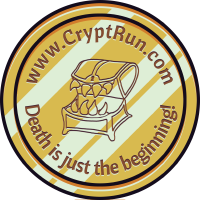 It’s been exactly one week since we launched Crypt Run on Kickstarter, and since it’s a 30-day campaign, that means it’s 25% over. What a great time to reflect on the week, examine the trends, and see where this campaign is headed! We launched via an email blast to our mailing list of about 200 fine human beings, as well as the mandatory blog, tweet, and Facebook post. I’m not aware of a way to check, but if memory serves, we closed our first day at around $2,000. One of our biggest and most awesome fans even contributed $1,000 (and claimed NO reward), which is just incredible. The very next day (Saturday July 13th) we did a live demo atCalifornia Extreme, which is an annual arcade and pinball expo in Santa Clara. This was an exhausting day, lasting from 9am-3am (we each basically worked 18-hour shifts that day). This was our first live demo and it was exciting and educating. We made some amazing connections, including a Sony rep, that have the potential to be beneficial in the future. 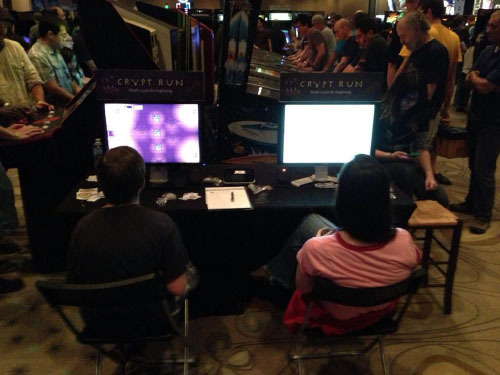 Crypt Run performed surpsingly well, especially with young males (around 8-15 years old). 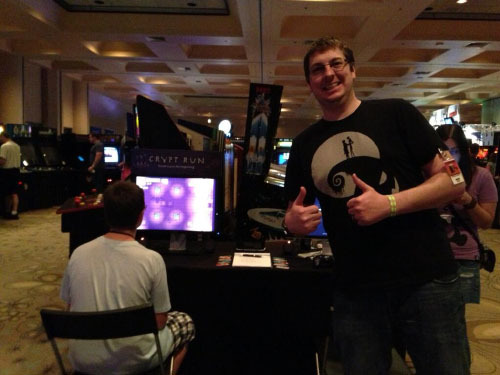 One enthusiastic young gamer played for FOUR HOURS straight! The pledges kept coming in throughout the day, energizing us when fatigue kicked in. Our friend Ricky came by and took high-quality pictures with fancy lenses, which I’ll upload soon. Sunday was much less extreme (pun intended). The expo was only open 11am-9pm, and the crowds were much thinner. We even had some time to play a few games ourselves! Over the weekend, we gave away hundreds of stickers with “cryptrun.com” printed on them, and the pledges continued to come in steadily. Sometimes it’s impossible to tell where exactly a pledge came from, but through emails and messages from backers, we know that a few hundred dollars came in directly because of California Extreme. Overall the live demo was a fantastic success and was just what this campaign needed to help its launch. Monday, the pledges really hit the breaks. Up until Monday, I’d wake up to several new pledge notifications and they’d be relatively common throughout the day. Starting Monday, there was just one new pledge, and then only a small trickle throughout the day. This would be the trend throughout the week. I’ve also had promising discussions with Indie Game Mag and Fund This Game, and I’m really hoping that Rock, Paper, Shotgun will include Crypt Run in its weekly Kickstarter Katchup series. 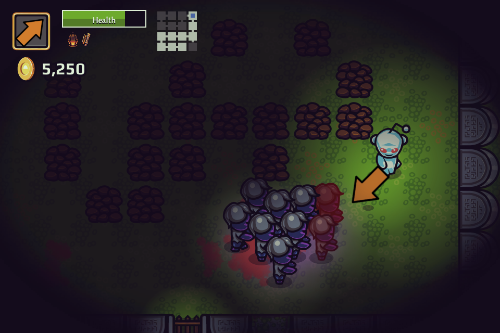 We also tried a Reddit promo where you can play as the Reddit alien. Kind of a stunt, I don’t know man, we’re just experimenting. It didn’t go terribly well but there’s a small chance somebody saw it and pledged. You’ve gotta try, right? The above pie chart shows that $566 were pledged via Kickstarter. This means that these pledges came directly from Kickstarter’s own discovery channels, such as the recently launched and games category pages. This graph shows the overall progress of the campaign. As you can see, it started off strong, but its ascent has slowed considerably. Good news if you’re a fan of Lostcast (or podcasts in general), because Geoff and I will be on an episode of DarkCast next week. We’ll also be recording a new “The Story Behind Crypt Run” video, as well as pushing out a new alpha build with many bug fixes and improvements. 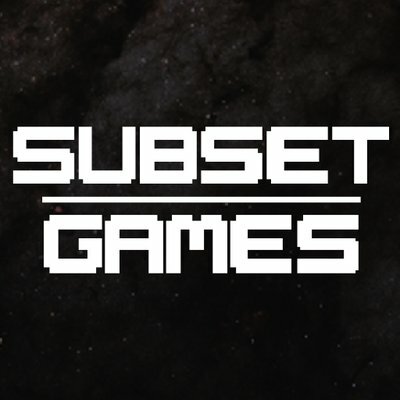 We’ll also be at Indie Prize Showcase which is a part of Casual Connect in San Francisco. This is a live 3-day demo that, thanks to California Extreme, we now feel well-prepared for. Overall, our first week went really well, and we’re very happy with the results and the current state of the campaign. 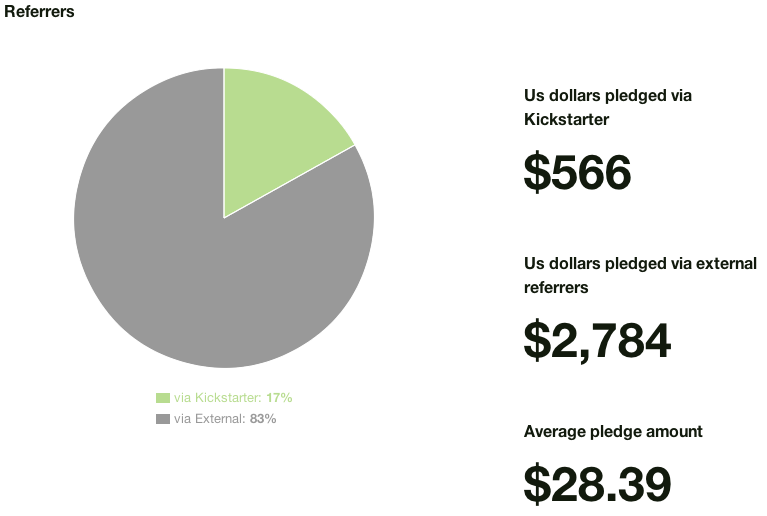 It’s now clear to us, though, that Kickstarter campaigns are a lot of work, the lion’s share of which takes place AFTER the campaign has launched.